Ah the British Film and Television Awards… A marvellous source of celeb-spotting, awkward one-liners and film accolades to keep us entertained for a whole night – and last night’s 2016 Valentine’s special was no exception. And when else do you get to see half of Hollywood grimacing as they brave the harsh British climes on the red carpet? It’s worth tuning in just to see who shivers hardest (and we’ve rounded up a whole host of celebs wishing they were somewhere else other than the (previous) BAFTAs purely for your enjoyment). Twitter’s still reeling from Fry’s gaffe about Jenny Beavan who won Best Costume Designer for Mad Max. Beavan collected her award in a casual ensemble and made a humble speech on-stage before Fry returned and joked that ‘only one of the great cinematic costume designers would come to an awards ceremony dressed as a bag lady.’ Yikes. It’s fine though – Fry and Beavan are actually close mates, but Stephen still had to clarify all this on Twitter on the actual night, after receiving a bit of stick, it seems. He said: ‘so just a word to the tragic figures who think calling Jenny Bevan a bag lady was an insult. She’s a dear friend and she got it. Derrr’ Ah, ok then we’ll let you off Stevey. 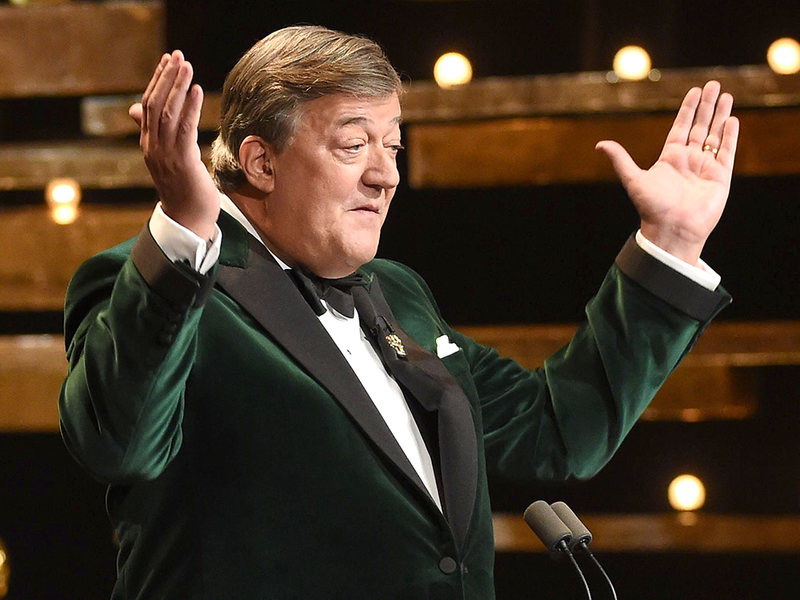 Every single time Stephen Fry killed it as the BAFTAs host. With half of Hollywood in tow, it was only right that Stephen Fry started the night off by completely taking the piss out of some American customs – one of which is the delightfully awkward kiss-cam. But seeing as it was Valentine’s, everyone actually got in the spirit of things (except camera-shy Michael Fassbender and Alicia Vikander who were having none of it). However, Maggie Smith and Leonardo DiCaprio, Eddie Izzard and Rebel Wilson and Bryan Cranston and Julianne Moore all enjoyed hilariously full-on smooches which you can watch below. We’ve gotta hand it to Rebel, the girl has serious balls. Highlights from her intro speech for Best Supporting Actor, included the actual lines: ‘I have never been invited to the Oscars, because as you all know, they are racist’, and: ‘one day I hope to return to win a BAFTA myself. I’ve already been practising my transgendered face’. As if that wasn’t enough, she also flirted outrageously with Beasts of No Nation nominee Idris Elba. ‘You’re making me nervous’ she said. ‘But I’m sociologically programmed to want chocolate on Valentine’s Day.’ Dear. God. Judging from the furore surrounding the Oscars for its lack of diversity, it was to be expected that it would get mentioned at the BAFTAs more than once. Actor and comedian Sacha Baron Cohen (AKA Borat/Ali G/Bruno) declared on-stage that he was there to present ‘Best White Actress’. 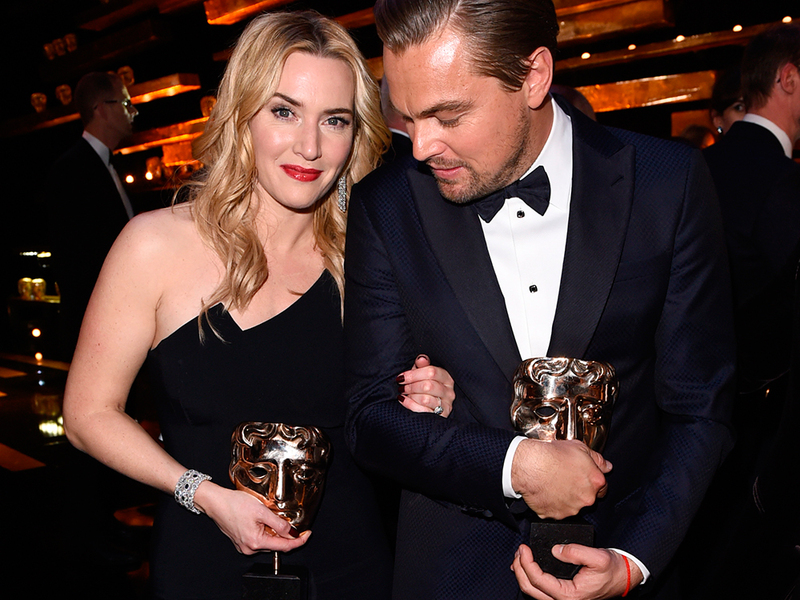 The legendary acting pair were reunited at the ceremony, strolling around arm-in-arm with their BAFTAs and looking like the bestest friends that they are. Leo even called Kate his ‘home girl’. Awww, you guys. 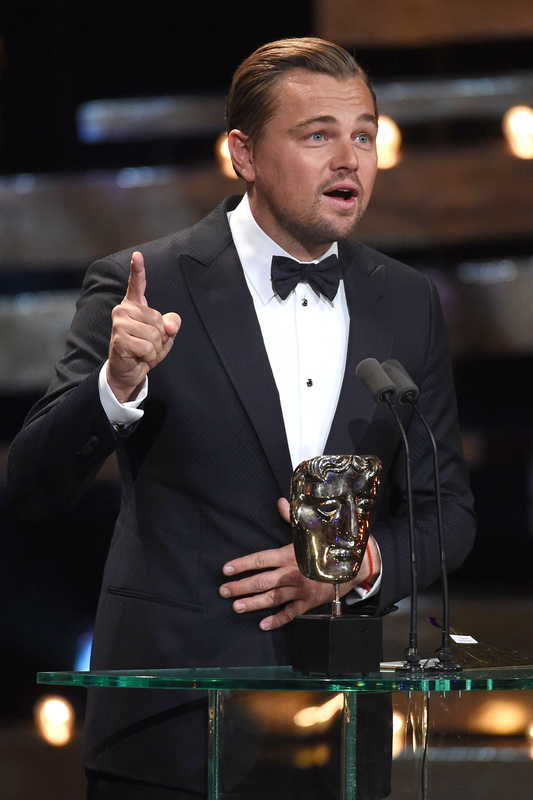 Of course in our eyes Leo’s always a winner, but now he’s been recognised by the BAFTAs for his role in The Revenant. And although we don’t want to jinx things, this pretty much means our boy’s a total shoe-in for securing an Oscar now. Get in there we say. As is the case each year, the BAFTAs acknowledges performers who have recently passed away in a ‘In Memoriam’ section of the show. Touching tributes to Alan Rickman and David Bowie (who both died last month, aged 69 from cancer) featured alongside legendary actors Maureen O’Hara and Omar Sharif, amoung others. 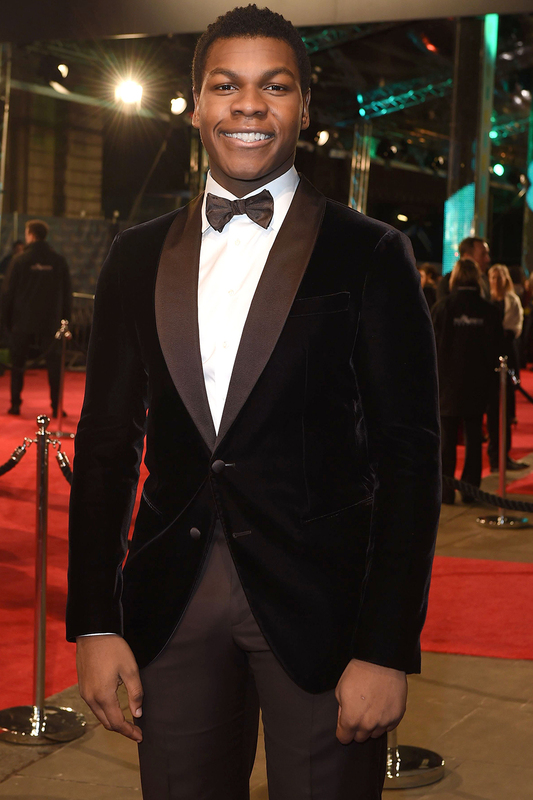 Stephen Fry and John Boyega were both sporting some seriously stroke-worthy jackets in a homage to ‘80s fashion. (We just want to touch it). Want some more BAFTAs fashion? ‘Course you do. See every gorgeous red carpet gown from the 2016 BAFTAs red carpet. Collecting her award for Best Supporting Actress, Kate delivered a wonderfully breathy and humble speech. ‘When I was only 14 I was told by a drama teacher that I might do OK if I was happy to settle for the fat girl parts. Well look at me now. So what I feel like saying is to any young woman who has ever been put down by a teacher or a friend or even a parent, just don’t listen to any of it because that’s what I did.’ Yo go Glen Coco! Watch her speech in full below and check out how Kate nailed her red-carpet look in our BAFTA beauty gallery. So, there you have it. Until next year, folks!